Good. 0450002314 ALL BOOKS SHIPPED WITHIN 1 DAY OF PURCHASE! 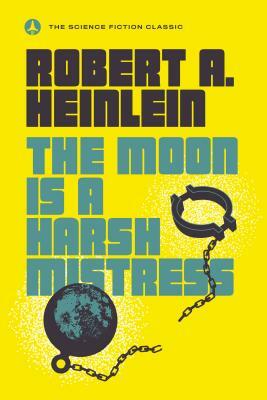 The Moon is a Harsh Mistress is a classic which even non science fiction fans will enjoy. I normally don't read science fiction, but I first read this book several years ago at the urging of a friend and found I couldn't put it down. It grabbed me by the shirt front and wouldn't let go! (Thanks, Gwen.) It has drama, comedy, love, action, and it even has a message that doesn't hit you over the head. The characters are believable, even the computer. Now who would think you could even refer to a computer as a character, much less a believable character? The story is timeless and could take place completely on earth and still have the same truthfulness and impact. Buy it, you'll like it. Heilein invariably writes a good story, usually with so much accurate detail it is believable. This book is no different and my favourite from him. It is also a sort of handbook for thte Libertarian Movement in U.S.A. as it deals with the concept of resistance to oppression by the administration. The location is the Penal Colony on the Moon but the general principles remain constant. As a Scottish 'Free Settler' who is also very much into computers now living in Australia , it has a threefold relevance and maybe not so very far removed from what could happen in the future. I first read it years ago and now have just bought a copy to pass on to the family once I depart the scene. If the reader does not like the setting of Sci Fi but enjoys a good story this will appeal as much as to the diehard Sci Fi addict. The true genius of Robert Heinlein was in how his characters always came through as real people, no matter how exotic the location or situation. even if they are not human. In this story, Mike is the control computer of 21st century prison on the moon, a machine which has had so many enhancements that he has become self-aware. But on waking, he finds the humans around him to be "stupid", for they cannot imagine that a machine can be alive. So he starts playing practical jokes to get attention, much like a human child. When the computer repairman understands the situation, he sees all kinds of possiblilties for taking advantage of the warden and making a profit on the side. But then they find that the resources on the moon are being depleted so rapidly that if the situation is not changed, the entire population will starve. Enlisting the help of his old professor and a young woman political activist, they begin a revolution to overthrow the warden and save the moon's population. Heinlein examines most of our commonly held beliefs and institutions through this story, including marraige, schooling, banking, and has several innovative suggestions for improving a democratic government. This book is Robert Heinlein at his best, a great place to meet a great science fiction author.